SINGAPORE, Apr 10, 2019 - (ACN Newswire) - Infinito, the leading blockchain R&D house from Singapore, is partnering with Hong Kong-based technology specialist Alpha Blockchain Consulting to bring blockchain values to a wider clientele and expedite the process of international adoption. 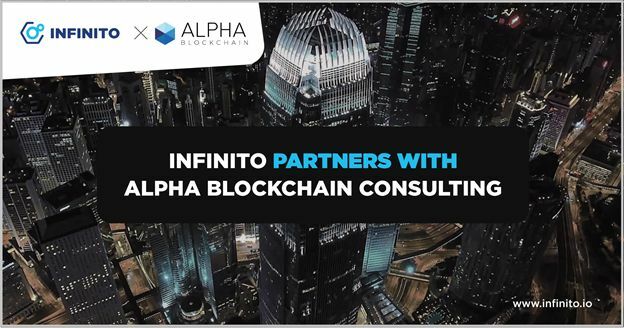 For this partnership, Infinito will be contributing its technical expertise in the areas of blockchain and cryptography technologies, while Alpha Blockchain Consulting will utilize its extensive knowledge and experience to provide in-depth consultancy and incubation for businesses looking to get started with blockchain, as well as develop projects as they arise in the market. Regarding the partnership, Infinito's Director Mr. Jack Nguyen remarked, "Infinito is excited to join forces with Alpha Blockchain Consulting on our quest to enable blockchain mass adoption. By combining our blockchain engineering expertise with Alpha's extensive consulting experience with tech projects and businesses worldwide, the two of us can power companies and end users across the globe with seamless access to benefit from the immense values of blockchain." "We are proud to be partnering with the largest blockchain team in Asia Pacific, and with our enterprise network, we together can spread adoption to the entire region, North America and Canada," said Allan Ta, Co-founder of Alpha Blockchain Consulting. Infinito is a leading blockchain technology house from Singapore with over 300 experts and 3+ years of professional experience in the field of cryptography and blockchain technologies. Infinito helps companies of all size easily realize blockchain values in their businesses. Infinito builds and operates an Ecosystem of products, solutions and services, either ready-made or custom tailored, to help businesses and developers seamlessly implement, develop, and run blockchain applications securely, efficiently and compliantly. Alpha Blockchain Consulting is an investment, development and advisory services firm focusing on businesses with next-generation applications using blockchain and smart contract technology. It is part of Alpha Blockchain Group, a multi-tier consulting firm that seeks exposure to the industry and investment opportunities for its investors and partners. The Group advises and invests in innovative companies including cryptocurrency and other blockchain-enabled technology companies with a potential for dynamic growth in all segments of the blockchain industry. See www.alpha-blockchain.co/.